Whenever I talk about insecurities with other individuals, I always feel like I don’t have the right to one, based on what theirs are. I always feel like mine are such petty, silly things that they shouldn’t matter as much as they do. Truth be told, I end up feeling ashamed of having one. I have struggled with having good eating habits for quite a while. Growing up, I developed a lot faster than other girls in my year, making me feel like an awkward, big human being next to their petite, delicate frames. I’ve always had a curvier body than most and it’s been something I’ve been gradually learning to love and appreciate but it’s been a very hard road to that self-love which I haven’t fully achieved yet. Anyways, it became pretty obvious to my frightened mind that I needed to cut back on what I ate. I’d try to limit what I’d have to eat at lunch time in high school, only to cave in later and eat a muffin. At home it was equally as difficult because I couldn’t limit myself as much as I wanted to because of my family’s presence. My difficulty with food surfaced one day in Puerto Rico over a winter vacation. Someone very close to me (through no bad intention) made the comment that I had a “love affair with food.” My eyes did not stop leaking for the rest of the day. My parents had no idea what my issue was. My mom only found out that I’d had this problem last year. I never became anorexic though, thank God. I was never able to fully starve myself, and I thank my lucky stars for that because I would have been faced with a million health problems. Leaving to college worsened my problem because there was no one there to supervise if I was eating properly or not. Here, I was able to lie to my mother over the phone, saying that I had had lunch and breakfast when in reality, I had not eaten since the night before. I’d try to combat this issue, which worsened when I was alone. I’d go out on my own to eat and just when I was about to take the first bite of food, I’d freeze up. I’d feel ashamed of myself for feeling hungry. I felt guilty that I was making the people around me watch me eat. In my mind, I was convinced that they were disgusted by what I was doing. I thought they were seeing a slightly chubby girl eating when she really shouldn’t be. In the end, I’d throw whatever I had away, flee to my room, and fall apart. 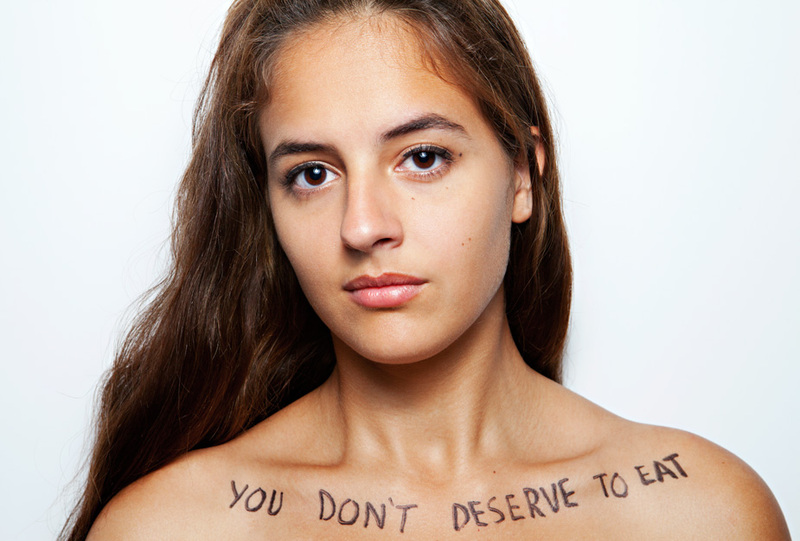 In my mind, I did not deserve to eat nor did I deserve to be hungry. Thankfully, these mindsets did not always occupy my thoughts and I was able to keep from becoming anorexic. I still have these thoughts today but now, I know that I do deserve to eat and that I don’t need to say the lies “I already ate” or “I’m not hungry” unless they’re true. I know it’s going to take a while for me to fully be free from this problem but I know I’m going to be okay.